Before you have reached Hyatt Lane which is the 6th stop of the Cades Cove Tour, you have probably crossed at least 2 streams which overflow onto the road. While these crossing present no real danger, I do rate this road for hiking as boot condition rather than sneakers if your wish to keep your feet dry. Hyatt Lane has been part of the Cades Cove transportation system for hundreds of years. It was first part of a Cherokee foot path that was used for hundreds of year before the first white settlers came into this area. Hyatt Lane cuts through open fields giving you an outstanding long range view, helpful to get an early morning sunrise shot with no obstructions. As with Spark Lane you can use this 2 way road to either cut your tour short, or extend it by running back to this point form the south side of the valley. As you first enter Hyatt Lane on the right side which is west, you will see a wooded "island" that is slightly elevated. While I don't recommend parking on the road during heavily traveled times, when it is quiet a short walk through the woods and you will experience one of the quietest areas of the Cove as well as numerous plants and wildlife. More often than not, the only people you will see on this jaunt will be those that came with you. Comming up on the left you will find the last church we will see standing in Cades Cove the Missionary Baptist Church. The church that is now standing here was built in 1915, but the congregation was formed 1939 when members of the Primitive Baptist Church who wanted to do more missionary work were expelled from the Primitive Baptist Church. 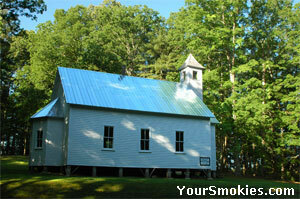 As with some of the other churches in Cades Cove, the congregation did not meet during the civil war. Confederate sympathizers who were members of the church however, never did return. Sunday school was held in this church from 1898 up until 1944. A special treat for those who visit here from March into early April is a planting of daffodils that spell out "CO 5427" that can be seen between the church and Tater Branch Crossing. These daffodils were planted the Civilian Conservation Corps 5427th company in the 1930s as they were building trails, roads, and bridges throughout The Great Smoky Mountains National Park. Majestic yet peaceful vistas in Cades Cove. Cades Cove Missionary Baptist Church of 1915. Right across from the Missionary Baptist Church you will find the entrance to Rich Mountain Road. When Hyatt road was still a cherokee trail, this was part of the same trail which would take you to Tuckaleechee now called Townsend. This was one the main thoroughfares of the early Cades Cove residents. In the 1830s this road was improved to become a wagon road which lasted from almost 90 years when the State of Tennessee built this more substantial road. The Rich Mountain Road (once called the Old Cades Cove Road) only runs one way - out of the park into Townsend. This unimproved road closes at dark and has no facilities lighting or shelter, however it can make for an interesting 1-1/2 or so slow ride. Road conditions dictate that no large trucks or campers are to use this road. 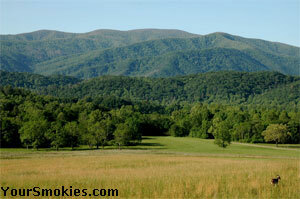 There are 2 areas where you get a nice view of the Cades Cove valley and one where you can look out to Townsend. There are also some trail heads on this road which lead onto quieter trails. All in all Rich Mountain Road can be an interesting ride but if you are limited in your time in the park, I would suggest you avoid it as there are far more interesting places to spend your precious time in the Smokies! The Cooper Road Trailhead is the next stop on our Cades Cove tour. While there is not room for many to park on the left the trail is usually quiet. Cooper Road started out as a modest Indian trail until the 1830s when Daniel David Foute a wealthy land owner in the Cove made it part of his route to Maryville. Joe Cooper improved to road to be able to handle wagons in the 1840s. For residents of the Cove this road was the most direct route to Maryville. This road is now a nature trail. While not a very rugged trail, what it lacks in spectacular scenery and waterfalls, it makes up in being accessible to many who could not handle a more rugged trail. By this point you should be starting to notice that at almost every twist and turn on the road you see a new vista unfold. Add to that the changing seasons and you can see why some people visit the Cove hundreds of times and still feel as though they have not seen all there is too see in the magical part of the Smoky Mountain National Park. Since the first time I visited the park in the early 60s Cades Cove has been changing - for the good. While some of the older buildings are still here some of the more modern buildings were removed long ago and the park itself is returning more to its natural state. It's up to all of us to make sure we help by not destroying wildlife, artifacts or leaving trash. The Elijah Oliver Place is one of the nicest cabins to visit within Cades Cove. It did experience heavy erosion and had an extensive rehabilitation efforts to repair the badly eroded areas around the cabin due to over visitation and poor drainage in the area. You are now on the far western end of the Cades Cove loop and will shorty see the road to the Abrams Falls Trail on the right hand side. The Abrams Falls Trail is incredible popular for good reason. What starts along a creek bed ends up in a spectacular waterfall with a beautiful pool below. If you only have a few days in the park and can handle a 5 mile hike, this hike should be tops on your list. Be cautioned that the road to the trailhead is 2 way.